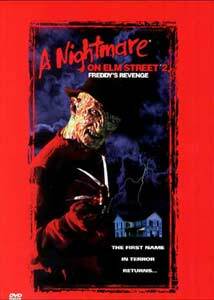 After the success of the original Nightmare On Elm Street in 1984, talk of a sequel instantly began. It took a short 12 months for Part 2 to hit screens, and as is the case with most horror sequels, Freddy's Revenge never goes to the heights that the first film reached, thus providing a much tamer horror film. Set 5 years after the first film, Freddy's Revenge takes more than one page from the original to create a plot that has been used and beaten to death more times than Freddy has. A new family has moved into the old Elm Street house despite rumors that people once died violently there. The parents (Lange, Gulager) naturally don't understand what's happening to their son Jesse (Patton) when he is plagued and possessed by the spirit of Freddy Krueger (the child killer who uses his razor-sharp fingers to tear people apart while they dream). Only Jesse's girlfriend (Myers) turns out to be any use in the battle for the boy's will and body, which Freddy uses to "get physical." While watching the film I kept wondering exactly how this was considered a plot. It seems to be less a story than a vehicle to show violence and whet the appetite of the teenagers who made the first film a success. This sequel is onl able to generate a few isolated moments of frightfulness, but not enough to make this a scary horror film. Director Jack Sholder does an admirable job behind the camera, but never really tries anything original. As a side note, Sholder is one of the only directors from this series that has not gone on to bigger and better things. Directors like Stephen Hopkins (The Ghost and The Darkness), Renny Harlin (Die Hard 2), and Chuck Russell (Eraser) have each taken a turn at the series. But I am not sure that even a gifted director could make a quality film with this script written by David Chaskin, which is so unoriginal that it feels as though he watched every horror movie he could to get ideas. The cast, much like the crew, is downright terrible. The film almost seems like a barren wasteland for mid 80's talent. Heavyweights like Mark Patton, Kim Meyers, and Robert Russler had their careers killed by this train wreck of a motion picture. Only Robert Englund, hamming it up as Freddy yet again, seems to get the joke. While the film is 15 years old, the transfer offered up by New Line on this anamorphic 1.85:1 transfer is top notch. Colors are sparse as this is predominately a very dark film, but both the black levels and colors are fine. There was no pixelization or evident grain. Kudos go out to New Line for creating a glorious transfer of an older film. A 1.33:1 full frame transfer is also included on this RSDL picture disc. The original aspect ratio is preferred; I think the pan and scan transfer could have been left off in favor of more worthy supplements. Presented in both a new Dolby Digital 5.1 soundtrack as well as the original Dolby 1.0 channel mix, Freddy's Revenge has never sounded better. While mainly a front heavy mix, the 5.1 soundtrack does feature a few surround effects, such as the incidental music and ambient sounds that grace the rear channels. The Dolby 1.0 channel mix is exactly that, so if you really want to relive the original experience of seeing this film that is the way to go. Unlike the first installment of the series, Part 2 is a bare bones disc. Extra features are limited to the original theatrical trailer, cast and crew bios and a "Jump to a Nightmare" selection screen. The disc also has numerous DVD-ROM features that unfortunately will not work with a Mac. When you consider that when it came time for Wes Craven to write the script for Part 3 of the series he completely skipped over this one, it is hard to recommend this movie. Like most films in a series, though, if you own the others then you might as well pick this one up also.